Using The Right Tools for Making Silver Jewellery. Before we begin these are some of the essential tools that you will need to embark on making silver jewellery. Flat nose pliers - Used for holding, bending and forming the silver into various shapes and styles. Half-round pliers - used for bending the silver without making the outside curve. 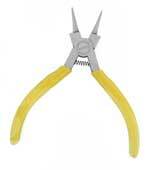 serrated edge pliers - useful for pulling wire through or making it straight. They can however mark the silver so be careful. Try to buy the best quality saw you can. The various blades are in different grades. To start with buy a grade 1, 0, or 0/1. The blades generally range up to 4/0. Needle files to start with are a flat, half-round, oval, and a triangular file. Large flat file is essential for removing solder from the silver. Large half-round file. Useful for cleaning the inside of the silver ring shank. An essential item for multi-purpose uses. The hammer can be used to tap or "peen" silver pins, rivets or narrow joints into shape. When choosing a torch it is wise to find one that can adjust easily from a narrow to a wide flame. For certain tasks, such as reticulation, its handy to have two torches. A hand-held torch and one that is fixed in a position where it is always directed toward the soldering block. Jewellery items that require soldering ought to be placed on a charcoal block which absorbs the excess flame away from the work bench. For soldering silver it is essential to use a Flux. The cheapest and easiest flux can be produced by rubbing a borax cone into some water in a special dish designed specifically for this purpose. When soldering two or more pieces together, this wire is useful for holding the pieces together whilst soldering. Always ensure the wire is removed before pickling. Its is also essential for casting. Many guides fail to mention this vital tool which is used to position an item when it is being soldered or annealed. Since Titanium has a much higher melting point than silver, it is an essential accessory for smooth and trouble free soldering. A useful tool when using stick solder, for holding pieces of silver together when soldering. A small vise attached to a bench is an essential item. Not only is it useful for bending but it has so many other uses such as holding the piece during filing. We have been online for over eleven years with various web-sites and in various styles. This web-site is the final resting place for our online selection and we endeavouring to expand it to include a resource centre for information on making silver jewellery. You can learn from this site the terms and expressions used throughout jewellery manufacture. In the meantime we start by outlining some of the basic tools and equipment you will need to embark on a process of making silver jewellery. Wherever you choose to work it is useful to have a ready supply of water for quenching, cleaning etc. For repairing silver jewellery it is always best to invest in tools that are made specifically for dealing with the properties and composition of silver.